Chris McClatchey is a nationally recognized speaker & coach. Chris teaches individuals from beginning investors to seasoned professionals, how to build and maintain real wealth through the use of real estate investments. 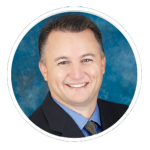 Chris is a real estate investor, licensed Realtor and attorney. Chris shares the seller financing knowledge and techniques gained in his 16+ years in the business through his seminars and coaching. He will teach you how to give the seller EXACTLY what he wants while getting EXACTLY what you want.